Whoever wins the US presidential election in 2016, Russia will work with them, President Vladimir Putin assured. He added that despite the differences the two countries have, they also share many common interests. “We will work with any American head of state the American people elect. Our cooperation is not with a particular person but with a nation, a big and powerful international player,” the Russian president said in an interview on Saturday, on Rossiya 1 TV. Among the common interests Russia and US share, according to Putin, are non-proliferation of weapons of mass destruction, fighting organized crime and terrorism, tackling poverty and other pressing issues. “We have a common agenda,” he said. “It’s a choice for the Israeli leadership to make, they can do what they see necessary,” he added. The Russian president also refused to confirm that Russia decided not to supply similar systems to Syria at Israel’s request. Earlier this week, Putin said a deal “with a certain Middle Eastern country” for S-300s was canceled due to Israel’s concern the system would endanger all flights over its territory. “I said what I said. That is enough, I believe. Experts know what I am talking about,” he explained. The leading position in the readers’ rating for Times magazine’s person of the year poll, which Putin won, is not really relevant and describes Russia rather than its leader, the president said in the interview. “The power of a nation’s leader is measured first and foremost by the economic power and military capability of this nation,” he explained. “Still I am grateful to the people who showed this respect, not to me – though it’s pleasant as well – but to our country, Russia,” he added. Putin refused to comment on whether Russia would recognize the self-proclaimed Donetsk and Lugansk People’s Republic. These are the entities in eastern Ukraine formed after the regions rebelled against the new government in Kiev, after it took power in a violent coup last year. The rebels declared independence from Ukrainian sovereignty, but are not recognized by the international community. “I wouldn’t speak about it right now. Whatever I say, it may prove to be counterproductive. We will be guided by the realities on the ground,” the president said. 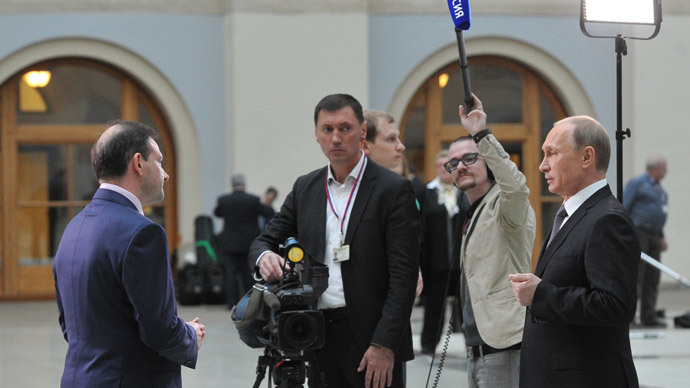 President Putin was speaking to Saturday’s news program anchor Sergey Brilev just days after his annual Q&A marathon.